Impressions of China from an experienced guide. From 1995 to 1997, Meyer (In Manchuria: A Village Called Wasteland and the Transformation of Rural China, 2015, etc.) was stationed in a small town as a Peace Corps teacher of English. 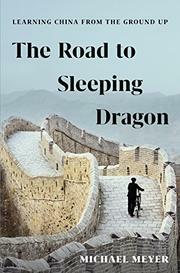 He later went on make bilingual travel journalism his livelihood, and here, he provides a humorous, detailed chronicle of the kind of bewildering, bracing contact impressions between him and the Chinese that illustrate both the huge divide between the two countries as well as the shared humanity. What he underscores throughout is how rare seeing a white person was for most Chinese at this transitional time and the curiosity of the Chinese students about Americans. Many admitted outright that they had been taught to distrust America, yet they liked him, whose name transliterated in slang as “Sold Son” or “Heroic Eastern Plumblossom.” Speaking Chinese that sounded like a Sichuan farmer’s, Meyer had many delightful and appalling adventures, and he delineates his experiences with a great verve and a light hand. He recalls the trepidation he felt when locals menacingly shouted their word for “foreigner” at him. But he also experienced a curious opening of the Chinese mind, a process that had begun some years earlier when Deng Xiaoping famously declared, “we have nothing to fear from the West.” As a teacher, Meyer was urged to “teach the Beatles,” which turned out to be “sound pedagogical advice.” The author posted many of his early writings to publications in the U.S. as well as to his family via letters. Eventually, love intervened, in the form of a fellow teacher at his new school in Beijing; Frances was a bright student thwarted in her ambitions until she met Meyer. The author depicts many moving moments, such as the wonder of one student when he brought them (for “extra credit”) to Tiananmen Square on June 4, 1999: the 10th anniversary of the famed clash. Some of the impressions are dated, but the majority are charming and revealing.